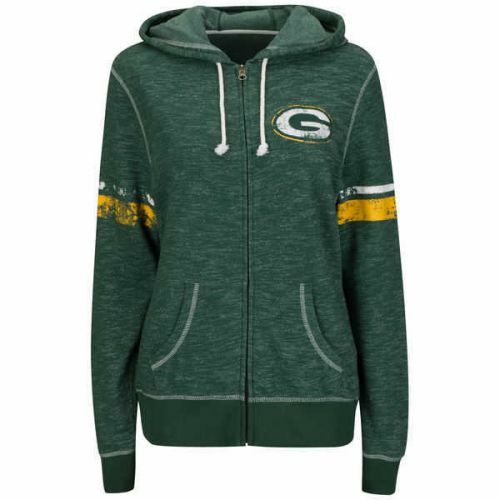 Green Bay Packers women's plus Athletic Tradition midweight full zip hoodie by Majestic has rib-knit collar and waist, two front pockets and hood with drawstring and the Packers logo on the left chest and gold and white stripes on the sleeves in distressed screen printing for a vintage look. Available in women's plus sizes 2X, and 4X. (HERNFL3WLPK) 60% Cotton/40% Polyester Majestic Women's Plus is generously sized for full figure women. Service Area: Shawano, Stevens Point, Appleton, De Pere, Kaukauna, Waupaca, Schofield, New London, Antigo, Little Chute, Hortonville and surrounding communities.